-This item is only available for pick up or local delivery. Delivery is available to customers within 150 miles from any of our stores. 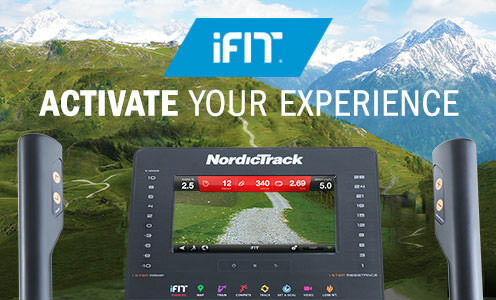 A revolutionary fitness brand, iFit*, helps you get much more out of each workout. Track your progress, replicate real-life runs with Google Maps™, train with Jillian Michaels, and custom-tailor your workouts to your specific goals. *Requires an iFit membership, sold separately. With the oversized, full-color touchscreen, you can more easily scroll through your stats or go online to read email, watch sports, or peruse your favorite social networks. Get professional training with 38 preloaded workouts designed by a certified personal trainer. Each app will automatically adjust the FS9i’s resistance and incline to meet calorie-burning, intensity, and performance goals. Stay completely cool with the oversized fan that automatically adjusts its speed to match your workout intensity. 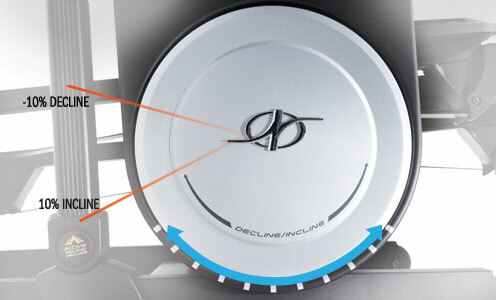 Plug your iPod®** into the console sound system and stay motivated with your favorite music. Ditch your ear buds for incredible sound from two 3-inch speakers. **iPod is a trademark of Apple, Inc., registered in the US and other countries. iPod® not included. No need to scroll through settings. With OneTouch controls, you can make instant changes to your resistance or incline at the touch of a single button. With cushioned pedals that ride on belts rather than on traditional crank-attached rails, the FS9i provides a feeling of walking on air. The floating suspension design allows you to adjust your stride length up to 38 inches at will for a smooth, nearly zero-impact rotation. 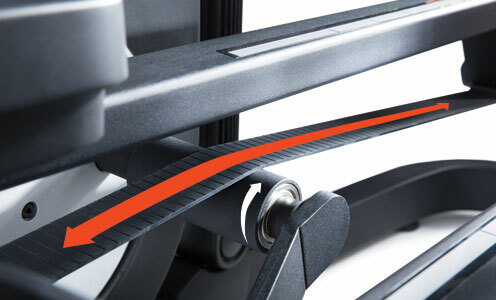 Combining the benefits of a stepper, a treadmill and an elliptical into a single machine, the FS9i is ergonomically designed to adapt to the way you move. The floating stride mechanism offers training that ranges from short up-and-down steps to long, 38-inch strides. And changing workouts is as simple as changing your stride. As you alter your stride, the machine moves with you, not you with it. The FS9i offers an impressive 10-percent-decline-to-10-percent-incline range, allowing you to focus your training on multiple muscle groups and burn more calories. Simple OneTouch controls adjust your incline at the touch of a button, so you can focus on your training rather than scrolling through options. With integrated technology from the iFit* brand, you can create custom Google Maps™ training routes anywhere in the world. iFit will display the Street View™ image on the screen and automatically adjust your incline and decline to match the natural terrain. You can also access an expansive library of workouts, train with Jillian Michaels, and automatically track all your stats. *Requires iFit membership, sold separately. Get your machine from out of the box to ready to work sooner. The simplified process reduces the assembly steps by half. Adjust your stride angle to recruit different muscles. 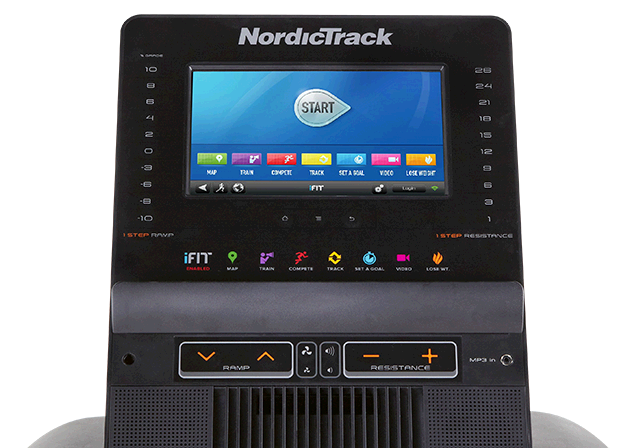 OneTouch controls easily adjust your workout up to 10 percent incline to burn more calories. Training at a decline allows you to simulate real-world terrain. Take your workout down to 10-percent decline at the touch of a button. Arm holds are attached to the stride rails, so your arm movement comfortably complements your stride and engages your upper body. Quickly transport the FS9i with front-mounted, built-in wheels. Engineered for incredibly smooth performance, this 20-pound effective flywheel is precision-weighted and balanced to deliver a silent, more natural ride. Maximize your results with heart rate training. The included wireless chest strap sends a continuous reading to the display so you can stay in the right heart rate zone. Shift through 26 digital resistance levels to add intensity to your workout. With OneTouch controls, you can shift to any level immediately without having to scroll through options. The FreeStride Trainer’s unique design allows you to adjust your stride length and shape at will up to 38 inches. 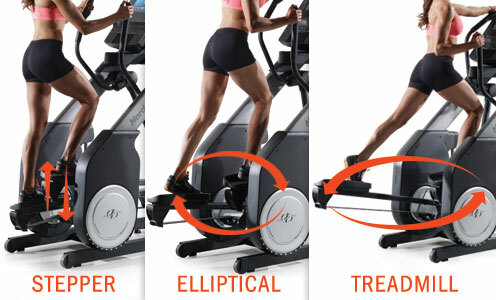 Choose a short vertical stride like a stepper or a longer gait like a treadmill.